Is Venture Debt overrated and overused for Early Stage companies? The question may sound a bit strange coming from someone who spent well over a decade advocating the benefits of Venture Debt for early stage companies. However, I cant shake the feeling that we’ve now moved into an environment where the benefits of Venture Debt have been over amplified, leading significant incorrect and overuse of the vehicle. 1) Venture Debt if used appropriately can be a fabulous source of non-dilutive capital that can help companies extend out cash flows and optimize equity ownership stakes of investors and employees. 2) Venture Debt from an experienced and reputable lending partner can have benefits outside of capital and significantly mitigate many of the risks that I cover in this post. 3) Venture Debt is easier and cheaper than ever to get today. We’re in a strong capital market marked by historically low interests levels couple with a crowded and fierce competitive lending landscape. As a brief recap, what is Venture Debt? Put simply, it’s a non-dilutive form of Term Debt financing for Venture Capital backed startups. To reduce complexity and ambiguity, Venture Debt in this post is only in the context of term debt financing to early stage companies — think Series A companies in cash burn mode. As such, I’m ignoring things like Accounts Receivable based or Recurring Revenue Working Capital lines which are distinctly different vehicles with different use cases and terms. While we are at it, let’s debunk the myth that somehow stills subsists that Venture Debt is a substitute for Venture Capital financing. It’s not. The only reason lenders provide cash-burning companies with debt facilities whose maturity dates exceed current cash runways are the expectation that the next round of equity will occur. Thus, the key driver for Venture debt availability is the quality of investor syndicate. Backed by Sequoia and Greylock? Doors are wide open for business. That same company backed by Joe VC (apologies if there is one out there)? Good luck trying to acquire Venture Debt financing. Let’s illustrate the use of Venture Debt through an example. Company X raises $4MM in Venture Capital Financing through a Series A round of financing and is projecting a cash burn of $750K/quarter. Believing that additional cash runway would be helpful to meet defined milestones prior to Series B, the company secures $2MM in Venture Debt Financing. Let’s say that the Venture Debt accrues interest at 8% and has a 6-month “draw-down” allowance (the window during which the company has the option of borrowing on the committed capital). From there, all borrowed capital amortizes over a 36-month period following the draw-down period. Let’s assume in this scenario, the company draws down the full $2MM in Month six. 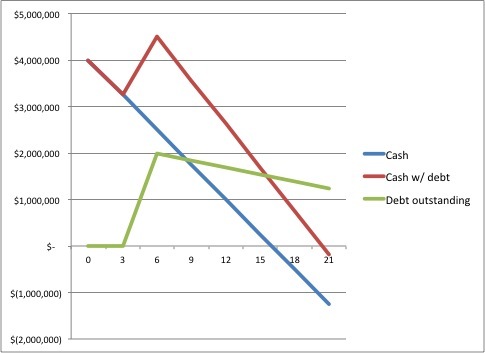 As clearly depicted, cash without any Venture Debt runs out in month 16. With the Venture debt layered in, cash doesn’t run out until sometime in month 20. In the startup world where every day is critical, those additional 4 months could prove critical to the company’s ongoing viability and to the company’s ability to optimize valuation for the Series B round through the achievement of incremental milestones. Sounds like I’ve made a case for Venture Debt, right? Every company that can, should take debt ASAP correct? Well, despite the neat theory the standard benefit use case provides, I’m suggesting that companies take a much deeper dive before making Venture Debt the default measure post of raising that early stage equity round. As suggested above, my position is that far too many early stages companies are taking on Venture Debt than should be (my stance is rather different at later stages and for working capital facilities). Here are just a few of the major considerations to contemplate. Lenders expect to get repaid whether your company is a success or not — While a bat wielding enforcer won’t be paying you a visit, it’s important to understand that lenders play at a far different point in the risk/return curve than equity writers. Most banks manage to early stage loss rates of <1.5%-2% and most Venture Debt Funds manage to loss rates of <4%. In order to manage to loss rates that are 15-30X lower than historical Venture Capital backed company failure requires legal and structural protection against downside scenarios. As such, the concept that Venture Debt is “insurance” or “free money” should forever be forgotten. True cost is often optically understated. In the proxy case above, the Venture Debt accrued interest at 8%. Fully drawn down and kept through maturity, the total interest payments total $256K. Tack on another $25K-$40K for legal expenses (you pay the lenders freight too) and upfront loan fees, and total all-in dollar expense is ~$275K-$300K. Not bad, but keep in mind that the usefulness of the debt is truly during the runway extension window found in months 16-20. The rest of the time is an exercise in paying interest on cash you already have from equity capital, both before, and after that next round of financing. Runway extension may not be as long or as valuable as you think. In the example, the Venture Debt gave Company X a runway window of 4 months. This is 4 months that the debt provides its theoretical usefulness. The 4 month window assumes that cash levels are allowed to dip to $0 before raising the Series B (or whatever form the new equity round takes). Zero chance this happens in practice. 1) The lender begins to exercise portfolio management and expects that an equity-funding plan be defined shortly as equity rounds, particularly external ones don’t come together overnight. 2) The lender starts maintaining very close contact with your management team for real-time updates and with existing investors to affirm ongoing financial support. 3) As the company get closer to cash out, the dialogue becomes more frequent, and the pressure to raise equity capital significantly increases. The lender may even have structural provisions to call a default and require pay down if that lender isn’t comfortable with the equity plan. To be fair, reputable lenders will always seek a soft landing vs. an abrupt stop. 4) The time and energy spent with your lender and raising equity sooner than you thought necessary prove to be a massive time and energy drain, making it more difficult to meet the milestones the added runway were expected to provide. Of course lender patience significantly increases if things are up and to the right with unequivocal support from equity investors. But if that’s the case, it’s probably a result of strong business execution where an up round would have occurred anyway without the Venture Debt. In short, Venture debt may provide true value-add runway, but it’s not a given. In reality, the scope and usefulness of the runway will is a function of a number of variables including lender profile, company performance, deal structure, and macro-economic climate. As noted at the outset, Venture Debt is easier and cheaper than ever to get. The number of banks looking to capture market share is greater than ever, resulting in the cheapest bank Venture Debt financing market we’ve ever seen. Venture Debt funds, which have higher internal hurdle rates, are taking on more risk in order to meet deployment and pricing targets. These two factors have significantly amplified the misalignment of lender/borrower interests. Lenders seeking to lock in business clients for the long term are willing to provide more debt at unbelievably flexible terms. The alluring nature of these terms cause hoards of companies to take on far more debt than they need. During up cycles where exit markets are robust, business performance is generally sound, and equity capital is free flowing, things typically work out fine broadly speaking. However, macro-disruptions could have severe implications for those that have fallen victim to overleverage. At best, being over levered in a down scenario leads to excess dilution in the next round; investors aren’t likely to ignore the large monthly debt repayment figure caused by that large senior stack of capital. At worst, a crash and burn scenario results, with angry lenders and shareholders present around the table. I’ve seen this movie before having lived through the down cycles that begun in 2000 and 2008. In summary, do I think early stage companies should completely steer away from Venture Debt financing today? Not in the very least. As stated above, taking Venture financing at the appropriate time, at the appropriate amount, with the appropriate structure, from a good lender can be hugely valuable. Rather, I think too many companies today rely on basic Venture Debt hypothesis leading to misfires on the risk (marginalize)/return (bloat) analysis.